Love these. This is my second runner. Subtle and classy. Works well with contemporary or traditional. Highly recommend. Even better with a pad under. This is absolutely beautiful just like the matching area rug I recently purchased. However, when used on the same flooring, it slides and the area rug does not. I am purchasing a non-slip rug pad in order to use this rug at all. It doesn't just move a little, it slid 2 feet and I nearly fell when walking across it. I recommend it if you're looking for a beautiful runner, but definitely buy the non-slip rug pad. This is a beautiful runner. Yes, colors are more vibrant than shown in picture but very pleasant &amp; great quality. A nice compliment to our home. Quality of rug is superb. Colors are a bit muted if you are looking for a blast of color. So far really enjoying the elegance and cushion in the hallway that it affords. Would like to order a 14 to 20' for another hallway. Still waiting to see if they appear again. First time ordering a non-wool rug. All my rugs in my house are wool - I also realized that all of them are Safavieh. Many that receive high use are seven years old and still beautiful. I measured for this runner to go in my bathroom. It's perfect. Excellent quality. The colors are rich looking. I wasn't sure I would like a non-wool rug and extremely pleased that there isn't a chemical smell. Love this rug. This rug is the perfect size for my space. Colors are as pictured. This rug allows you to add any color to your decor. I love it!!!!!!!!!!!!! I really love my Safavieh Monaco Vintage Bohemian Muti-colored rug! The colors are bright and vibrant. I get compliments everytime a guest visits. Bought the runner and two 3x5 rugs for the Master. These are beautiful. I love the Bohemian flair and the bold colors. Its both bold but muted at the same time. good on the fetet as well! Highly recopmmend this rug and any Safavieh product. Perfect size for in front of my kitchen sink. So soft. My cat and dog are always lying on it. Matches perfectly with my larger living room rug. This rug is great! It has just enough softness and seems strong enough to handle a higher traffic area. The rug is also thin enough so that doors can easily open over it. The colors are beautiful and definitely bold, but everyone needs more color in their life! I love it! 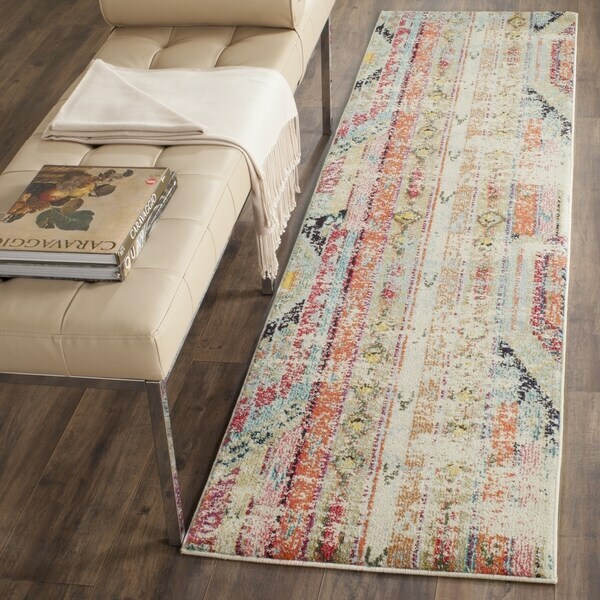 I absolutely love this rug, the style and colors are beautiful. It makes a great addition to my hallway and ties together colors throughout the house. My only drawback is how easily the rug moves around, I would recommend getting a slip pad to go underneath to prevent movement. It also took about two weeks before the corners laid flat. I would highly recommend this rug. If you're sure you want it then go for it. But if you're not, I'd suggest buying local. It costs fifteen smackaroos to return a runner. I loved the color palate of this rug and it arrived just as pictured. The weaving is firm but feels soft on the feet. We bought two, one for each side of the bed. I was a little afraid to order this but I'm so glad I did. I love it and it's perfect for my entry. Looks just like the picture. Love this as an accent rug. I bought two sizes and will probably buy more to coordinate. Good quality, beautiful colors. These rugs are just stunning! The colors are beautiful and are true to the images as shown. I bought a second rug to match this one months later and noticed the color and wear and tear has held up well! The colors in this rug are great! Really brightens up a room. Love it! I thought I was going to love this runner but it just didn't work for me. The quality was great but the vintage-y patina looked overly fake. Maybe it shows better in a full size rug? Great colors and has a nice texture for a poly rug. I will probably come back and buy the larger one for the basement! Fast shipping as well! "Would this work in a kitchen?" I personally wouldn't use this in a kitchen, but I guess it depends on your kitchen design/layout. "Love all the colors but, arre some of the colors more of an orange rather than a red? I really can't tell." Hi - orange is more predominant than the red - there are several strips of red but a bit more to the maroon side. Our room is more in the aqua and gold so this works great for a splash of color. Hope this helps! Definitely more orange than red, but the red is there. I got it to go with red chairs and it did match with them. Mine is more orange than red, although there is some red along the edges. More vibrant than I wanted. Pictures made it look more muted. I chose it as a complement to the living room carpet I purchased. Needing a vintage looking runner for my entry. "Does the Monaco Bohemian Multicolor runner come in a longer length?" It also comes in larger options under item #18647258 and item #18647260.